The Wild 3 is 10 paylines and 5 reels video slot game powered by Nextgen gaming limited. Total coins for the game is 10. You can play this slot at any of your devices including mobile phones, desktop and laptop with help of coin sizes 10p to £200 per spin. There are 7 bonus rounds exist in this slot game. The free spin bonus feature would give you 5 to 30 free spins and you will have a chance to win up to 25,020 times of your total bet as jackpot. 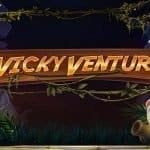 This is an adventurous slot machine made by Nextgen gaming, so if you want to play this slot then you can take your guard on with any Nextgen gaming online casinos listed here. The symbols of this amazing slot machine are cacti, purple cacti, tall cacti, vultures, safes, banks, money bags, gold bullions and cactus flowers. Banks and the vultures are the highest paying symbols of this game which can give you 25 times of your total bet if you land 5 of these symbols across your payline. The Wild 3 has 3 wild symbols and they are the Wild Bull, The wild Racoon and the wild coyote. The game also has scatter symbols. The wild symbols of this game can replace all other symbols except the scatters. 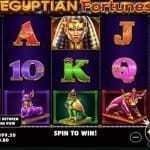 Now take a look at the features of this slot machine made by Nextgen gaming software platform. 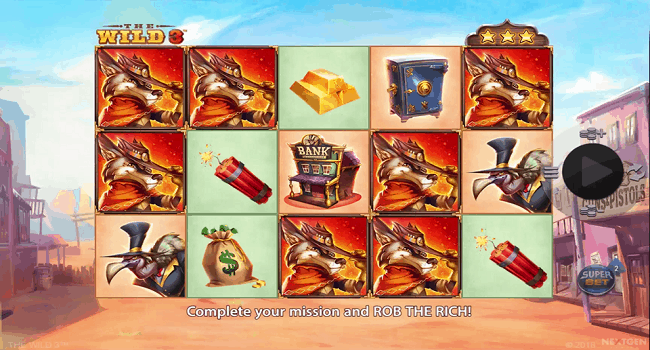 Wild Racoon feature – when the Wild Racoon appears on the middle reel of the game, it can replace other symbols like non-wild symbols with Wild Racoon symbol and that will form a winning combination for you. 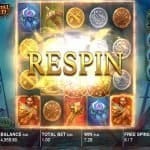 Meanwhile if you land 2 bonus symbols on the reels then you will get a scatter win. Wild Coyote feature – During this feature, all the cactus symbols (green, purple, and tall) will turn in to Wild Coyote symbols, if you land Wild Coyote symbols on reel 3. Wild Bull feature – if you land Wild Bull feature anywhere on the reel then you will get multipliers of 2x,3x,5x or 10x on your total bet.